Home / News & Media / News / The House and the Senate of the Philippines debate Charter Change with Experts - what's next? International IDEA concluded on 5 April 2019 a series of Learning Sessions, which ran in the Philippines between April and September 2018. The Sessions were run in partnership with the Institute for Autonomy and Governance (IAG), the Congressional Policy and Budget Research Department and the Senate Economic Planning Office with funding from the Australian Embassy to the Philippines. Each session was structured around emerging issues in the Charter Change (ChaCha) debate in the Philippines (including electoral system design, human rights and justice sytem reform, promoting economic growth and federalism) with local and international experts providing frameworks and issues for participant consideration. The Sessions were widely attended and were each memorialized in Charter Change Issues Briefs which will be available to the public online shortly. A final publication consolidating all expert inputs and disussions in the Congress is expected in May 2019. The final Session brought members of the House and Senate together to talk about the concrete constitutional proposals that are currently circulating in the Philippines and highlight challenges related to moments of constitutional change and transitions to new constitutional orders. Presenters included members of the 1986 Philippines' constitutional drafting committee as well as members of Duterte's 2018 Consultative Committee, which produced a draft constitution. International IDEA brought Dr Sakuntala Kadirgamar, Executive Director of the Law and Society Trust, Sri Lanka, who advised that the the Philippines should "localize" the process of writing a new constitution, both by considering how the changes will affect regular people and in getting them to participate in and contribute towards the new draft of the basic law. "Today, citizens want to be consulted, but if they do not understand the process, they expect their government and civil society to explain it to them," she said. Kadirgamar, who called Charter Change both a process and a dialogue, noted that there is "nothing to stop local communities from listening to their people and provide a draft" of how they would like the new system of government to be. "I hope you seize the moment for that." She said. International IDEA's Constitution Building Advisor for Asia and the Pacific, Amanda Cats-Baril, also delivered a presentation highlighting the functions and formats of transitory provisions in constitutions and potential challenges that accompany constitutional transitions, and particularly, shifts to federal systems. She highlighted the need to reflect on how federalism is connected to the priorities of the Filipino people, for example how it can relate to economic growth and job creation. 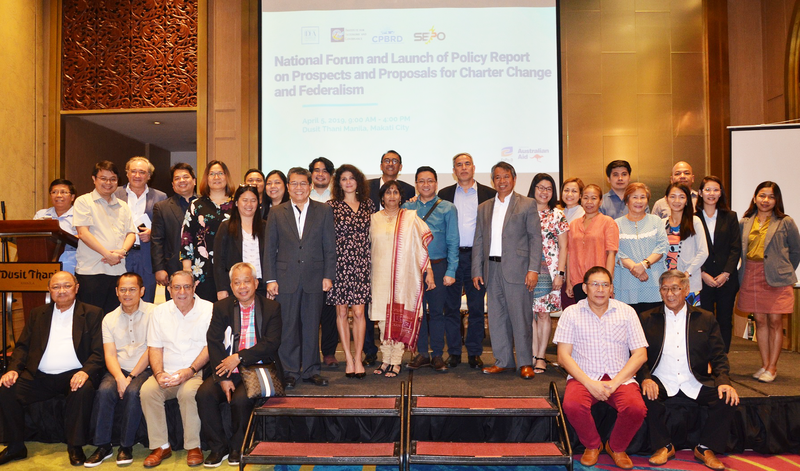 Filipino experts hotly debated whether Charter Change is needed and if/how it will become an issue in upcoming congressional elections in May 2019. Dr Julio Teehankee, professor of Political Science and International Studies at De La Salle University and a member of the Consultative Committee to Review the 1987 Constitution, said Charter Change should be an election issue as the Philippines prepares to elect new leaders and legislators. Ronald Golding, director general of the Senate Economic Planning Office, said advocates of federalism need to keep the discourse on Charter Change going, especially with a "new set of legislators who will decide if Charter Change is worth pursuing or not." After three thematic panels, Local Government Undersecretary for the Department of the Interior and Local Governance (DILG) Jonathan Malaya presented an insider's perspective on the way forward for ChaCha in the Philippines, including the formation of the government's Inter-Agency Task Force (IATF) on Federalism and Constitutional Reform. He said that consultations are ongoing and that agencies included in the IATF are expected to submit data-driven proposals by May for consolidation. He added that the work on the draft will be transparent and that reports will be "made available for everybody to scrutinize." Amanda Cats-Baril is International IDEA’s Senior Programme Officer and serves as a constitution-building adviser for the Asia Pacific region. In this capacity she supports constitution-building processes in Nepal, Myanmar and the Philippines, amongst other contexts, through the provision of technical assistance to governments, civil society organizations and International IDEA projects. Issues of focus in these processes include federalism, decentralization and autonomy arrangements; systems of government; and accountability institutions, rule of law and human rights.